Rolf Suey - Better Late Than Never: Miclyn Express Offshore – Following the footsteps of Pacific Radiance and POSH? Last week, Singapore-based Miclyn Express Offshore (MEO), which delisted from the Australian Securities Exchange (ASX) last December, is eyeing a listing on Singapore Exchange (SGX) in the next two to three years. "Its chief executive, Diederik de Boer, said the provider of offshore-service vessels is looking to tap into greater liquidity and keener interest in the sector here. "There is bigger retail investor interest in Singapore than in Australia, so SGX is perfect for our (company) size," he told The Business Times. The 35-year industry veteran added that the conditions for listing here were favourable, given that SGX is trying to position itself as a capital-markets hub for offshore and marine stocks. Miclyn is founded by Singapore entrepreneur Michael Kum in 1976 as an offshore vessel provider. The company got its name from Michael and his wife Lynda. In 2007, Australia Macquarie bank acquired 60% stake in Miclyn, preceded by the acquisition of Express Offshore - provider of crew/utility boats owned by 50-50 JV of Svitzer and Wilhelmsen. The two acquired companies were combined and renamed Miclyn Express Offshore (MEO). In 2010, MEO was listed in ASX with both Macquarie and Michael Kum sold down their stake to 30 and 10 per cent respectively in the A$365 million IPO. MEO ended its first day listing at A$1.90 a share with a market value of A$515m. End last year MEO delist from ASX after investor groups comprised of SEA6 Ltd and CHAMP Marlin Holdings Ltd, acquired the remaining shares they don’t own by providing a 20% premium price of A$2.20 that values the company at ~A$600m and more. SEA6 is owned by a Hong Kong- Private equity firm Headland Capital Partners which also acquire SGX listed Kruez Subsea from Swiber this year. MEO operates in segments of offshore support vessels, crew/utility vessels, tugs, barges, coastal survey vessels, third party vessels, project pipe transportation and shipyard services. MEO provides service vessels to offshore oil and gas industry, across South-East Asia, Australia and the Middle East. It employs approx. 1400 employees. The company is led by CEO is Diederik De Boer who is a 35-year industry veteran assisted by COO Darren Ang and CFO Derek Koh, all have strong relevant experiences within their fields. Below is the segment results FY2013. Revenue driver from 3 segments OSV, Crew/Utilities Vessels and Tugs/Barges. OSV – 84% utilisation rates. Outlook positive. Crew/Utility Vessels – 93% utilisation rates. Very strong and growing. 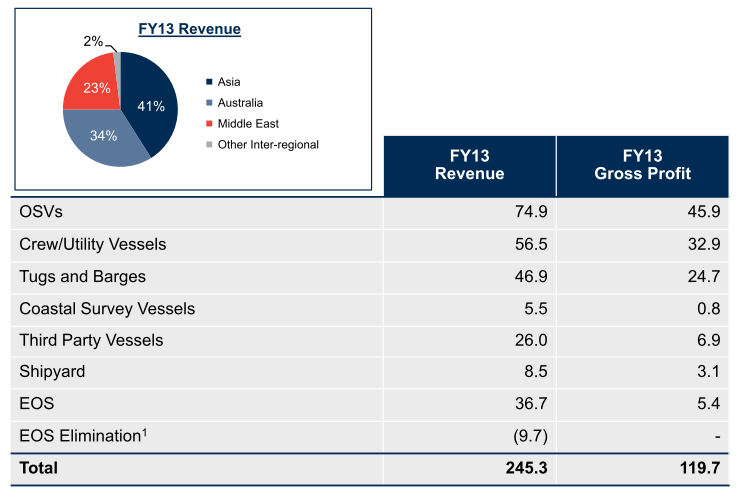 Tugs n barges – 76% utilisation rates. Possible decline due to Australia demand contraction. Coastal survey – 55% utilisation rates. Plan to exit this segment over time. Third party vessel. Non core and opportunistic earning streams. Shipyard - exited the segment in 1H14 by selling yard off. Positive Outlook for the group in FY14 with earnings growth expected. End Mar this year, MEO announced 1H14 results with summary as follows. For presentation report, click here. Summary as follows. For presentation report, click here. Using FY2013 NPAT of US$46m & NAV of US$403m and assuming MEO Market Capitalisation of AUD600m or USD558m, Miclyn Express PE is 12.2 and PB is 1.38. Below a comparison table of MEO to its competitors within the industry. Reasonably sound company with business model very similar to Pacific Radiance. While fundamentals are sound, investors' appetite may be bored by yet another OSV company IPO. Meanwhile let's wait for IPO prospectus before we "dig" deeper into the company.